Things are looking up for the Ontario mining industry in 2018. After an extended period of declining or weaker than expected economic growth rates, many commodity prices are rebounding. Yes, there is persistent volatility, but there is no denying that a feeling of optimism is returning to the mining industry. In looking to the future, we are buoyed not just by the markets, but by the knowledge that the world needs sustainably- sourced minerals and metals to make modern life a reality. Demand will only grow as we transition to low carbon technologies. After all, none of them are possible without the products of mining. Rich in resources, Ontario mines them responsibly. We have a world-class safety record, clean processes and low carbon emissions when compared to other industries and jurisdictions. Furthermore, OMA members continually strive to operate according to the highest standards of excellence, balancing their economic, environmental and social responsibilities. This unwavering commitment to steady, continuous improvement creates an innovation momentum that is poised to produce some truly revolutionary results. There are many new developments – big and small – that are transforming the way we mine, reducing our environmental footprint, and thus contributing to decarbonizing our planet. Moving to battery-powered underground vehicles, which cut ventilation and cooling costs while creating a healthier environment for workers, is a growing trend in Ontario mines. Currently, Glencore, Goldcorp, and Kirkland Lake Gold are using electric fleet technology, while many others are engaged in pilot projects. For instance, Vale’s Coleman nickel mine is testing battery-powered load-haul- dumps (LHDs) in its lowest orebody, striving to remain as carbon neutral as possible, notwithstanding the growing depth of the mine. 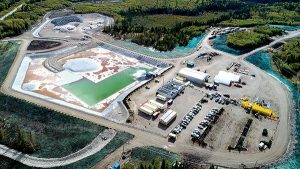 Meanwhile, at Kirkland Lake Gold’s Macassa and South Mine Complex, more than 80% of gold production is linked to battery vehicles, with a track record underground of more than 200,000 hours of production. Sensing a growth opportunity, manufactures of industrial tools and equipment have accelerated research and development. For instance, Epiroc – part of the Atlas Copco Group, unveiled a two-boom jumbo, equipped with a lithium-ion-phosphate battery, which is to be used at Glencore’s Sudbury Integrated Nickel Operations Nickel Rim Mine. Innovative onboard charging technology allows the unit to be charged while it is drilling, extending its operating time to a full shift. Increasingly, companies are designing their sites around battery equipment. Glencore is planning its Onaping Depth site with an all-electric mining vehicle fleet in mind to manage ventilation challenges, while Goldcorp is partnering with Sandvik Mining to roll out a BEV fleet to be used at Borden, where it building the world’s first all-electric underground mine. The investment in electric equipment at Borden will improve safety performance and eliminate upwards of 7,000 tonnes CO2e (carbon dioxide equivalent) of GHG emissions, or 3 million litres of diesel per year. Over a 10-year life of mine, this represents a reduction of 70,000 tonnes CO2e and a reduction of 330,000 MWh in electricity. Additional sustainability initiatives being implemented by OMA members include fuel switching, ventilation on demand, peak power reductions, using compressor excess heat to help heat buildings, geothermal heat recovery, truck payload optimization and lighting retrofits, to name a few. As mines go deeper, there is a pressing need to adopt innovative technologies. Companies are embracing automation, tele-remote operations and digitization to enable a safer and more productive future. Goldcorp’s Red Lake Gold Mines implemented tele-remote operation of scoops from the surface in 2015, adding an underground loci (locomotive engine used to transfer ore and waste rock material) in 2017. Barrick Gold partnered with Cisco to implement a digital transformation of their operations. Now, self-driving vehicles and sensors are making mines safer for employees, while data and analytics are helping refine processes. To inspire our members, enable information sharing, and keep the innovation processes moving, the Ontario Mining Association launched our Target Zero+ campaign in 2017. The focus of this collaborative campaign, initiated under the leadership of former OMA chair, Marc Lauzier and sustained by our current chair, Duncan Middlemiss, is to drive enhanced performance in health and safety (mining with zero harm); environmental protection and energy efficiency (mining with zero carbon and zero waste); and productivity (building global competitiveness). Our partners include governments, industry coalitions and academic research institutions. We are also seeking to harness inputs from some of the brightest young minds in Ontario though the MINED Open Innovation Challenge. #MINED2018 is open to undergraduates at the University of Toronto (Lassonde Institute of Mining), Queen’s University (Robert M. Buchan Department of Mining) and Laurentian University (Bharti School of Engineering). The students are asked to solve an industry challenge, drawn from OMA member companies’ real life mining operation scenarios, and submit a proposal by March 12, 2018. Finalists will pitch their ideas to a panel of industry leaders at a Dragons’ Den-like event on May 17, 2018. Last year, the impressive panel included Jennifer Maki, CEO of Vale, Tony Makuch, president and CEO of Kirkland Lake Gold, and Steve Thomas, CFO of Goldcorp’s Canada Operations. The event was emceed by George Flumerfelt, president & CEO, J.S. Redpath Ltd., who is returning to oversee proceedings on May 17. The names of the ‘Dragons’ will be revealed soon. In addition to invaluable exposure, the three finalists walk away with substantial cash prizes: $15,000 for first place; $10,000 for second place; and $5,000 for third place, with the potential to win an additional $5,000 Audience Choice Award. This year, we are also inviting undergraduates from any Ontario university or college to submit a five-minute video that imagines how Ontario mining will reinvent the future. The winning video, which is intended to motivate visionary thinking and inspire action by industry leaders, will receive $10,000. When it comes to protecting the environment and fighting climate change, Ontario mining is part of the solution. With #MINED2018, we are putting this notion at the centre of our innovation strategy, involving forward-thinking Ontario university students in an initiative to ignite ideas and cause us (and them) to think differently. CHRIS HODGSON is president of the Ontario Mining Association.